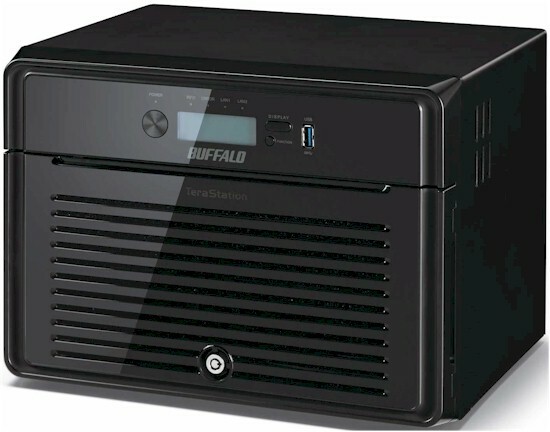 Buffalo has retired its TeraStation Pro line and replaced it with the new TeraStation 5000 series. The new platform comes in variations sporting from two to eight drives in desktop and rackmount versions. All are powered by either 1.86 GHz Intel D2550 or 2.13 GHz D2700 dual-core Atom processors with 2 GB of DDR3 RAM. As the table below shows, all also have both USB 2.0 and USB 3.0 ports, but no eSATA. Buffalo sent the top-of-line 5800 for review, so let's get started. Bufalo has opted for a lockable front panel, that can be completely removed to expose the eight hot-swappable 3.5" SATA drive bays. That #12 Factory Use Only port behind the front door is a standard VGA port. So when you connect a monitor and USB keyboard mouse, you can just fire up a server console and have at it. Buffalo still includes a serial port for syncing with UPSes that use that connection method. Note the Boot Mode switch (13) that allows for booting from a USB recovery drive. The 5800 is designed for moderately easy serviceability. The two fans are on panels and can be changed without removing the cover. Once the cover is off, you can get right at the power supply and regulator boards. The board is mounted on the side and plugs right into the drive backplane. Removing the main board requires taking off the back cover. The 5800's board (above) bears a strong resemblance to the TeraStation Pro Quad's board (below). But they are different boards. The key components of both are summarized and compared in Table 1. The review unit came with eight Seagate Barracuda 2 TB (ST2000DXM001) drives installed, which brought the total power consumption to 79 W. There is no idle drive spindown feature, but you can program three sleep / wake schedules to save some power. The system was relatively quiet for an eight-drive NAS. The fans ramp up to full speed during boot, but then settle down after the system is fully up. I rated total noise as medium. Definitely audible, but not annoyingly so in my quiet home office.